Fables writers Bill Willingham and Matt Sturges's run on Justice Society of America is about to get a whole lot bigger, as the book will be splitting in two to tackle the team's gargantuan roster. DCU senior executive editor Ian Sattler moderated a panel full of writers and artists from the ever growing world of Justice Society, including group editor Mike Carlin, writers Willingham and Sturges, Power Girl writer Jimmy Palmiotti, JSA vs. Kobra writer Eric Trautman, and current Final Crisis Aftermath: Run artist Freddie Williams. They confirmed not only DC's continuing commitment to the Justice Society in the wake of longtime writer Geoff Johns' departure, but also unveiled two new titles that will supplement the regular Justice Society book. After Willingham and Sturges's initial arc on Justice Society, each will take his own book, with Willingham remaining on Justice Society — while Sturges takes on the new title JSA All Stars. Jesus Moreno, who joins Willingham and Sturges as the new artist on Justice Society, will remain with the main book while Freddie Williams handles the art duties for JSA All Stars. The decision to divide the team was in part motivated by the almost unmanageably large roster the Justice Society now features, with dozens of heroes currently affiliated with the team.For the characters themselves, the decision will not purely be a matter of practicalities, as Willingham indicated the two teams will have two different missions and two very different strategies to accomplish their objectives. This change reflects fundamental differences between parts of the current team that can best be served with separate groups, although the panel stressed this does not mean the JSA is dissolving. This move may remind readers of a previous Justice Society spinoff, namely the eighties series Infinity, Inc., which followed the children and successors of the original JSA. There is a similar generational divide underpinning the split between Wallingham's Justice Society of America and Sturges's JSA All Stars, with the older Golden Age characters remaining on the former and most of the younger characters moving to the latter. 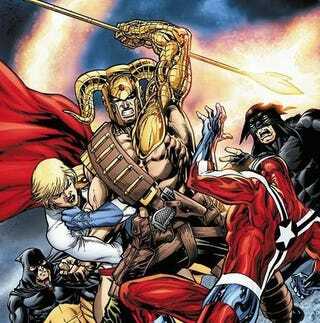 The panel revealed the cover of the first issue of JSA All Stars, which featured Stargirl, Cyclone, Magog, Power Girl, Judomaster, Citizen Steel, Hourman... and the new character King Chimera, who is the son of Golden Age master of disguise King Standish. The roster of Willingham's Justice Society can largely be deduced by process of elimination from those current members that aren't on the JSA All Stars cover, although there will be one major member returning after a lengthy absence. In exchange for allowing Matt Sturges to take Judomaster for JSA All Stars, Bill Willingham convinced DC to let him bring back Doctor Fate. The other new book will be more of a spinoff than companion piece, as Magog will follow the divinely created antihero, as he tries to better understand who he is and why nobody likes him. Keith Giffen will write the book, with Howard Porter (best known for his work on Grant Morrison's JLA run) providing the art. The book will also reveal more of Magog's past and the nature of his powers. Magog is the second spinoff book in what might now be accurately called the Justice Society franchise, joining Jimmy Palmiotti and Amanda Conner's Power Girl book. These four books won't necessarily crossover much, although major events in one book will likely be acknowledged where appropriate in the others. Although the panel was excited to share what is down the road for the Justice Society, they tried to remain quiet (without much success) about what the first story from Willingham and Sturges will entail. Due to begin in only two weeks, this first arc revolves around a mysterious black egg discovered in JSA headquarters. While no one on the team is quite sure what to make of the egg - although the panel assured the audience that the egg will explode, if nothing else - some unknown villain has placed prices on the head of every member of the Justice Society, bringing a wave of prospective bounty hunters to their door. The wildly varying bounties (ranging from well over a million for Green Lantern to about two hundred dollars for Damage) provoke a great deal of humorous infighting, although no one knows what to make of the fact that Stargirl is the only member who doesn't have a price placed on her head. In addition to what will soon be four JSA-related books, there are a number of specials and one-shots planned. Eric Trautman's JSA vs. Kobra miniseries is still ongoing, and the panel promised there will be plenty more explosions and collateral damage in the remaining issues. The end of 2009 will see a JSA 80-Page Giant, which will include seven different stories. Beyond the JSA All Stars creative team of Matt Sturges and Freddie Williams, the 80-Page Giant will feature the talents of Jerry Ordway and James Robinson. And, in early 2010, the JSA Annual is tentatively planned to bring together JSA All Stars and Magog, with their respective writers and artists teaming up on the issue. Looking even further ahead, Bill Willingham revealed that incoming Justice League writer James Robinson has officially invited him and Sturges to return to the annual tradition of JLA/JSA crossovers. Ian Sattler mentioned that the logistics of this might make pulling this off impossible for at least a couple of years, but Willingham remains optimistic. If nothing else, he noted that Robinson granted him the use of Black Hawk Island as part of the deal. Ultimately, all of these moves are premised on the notion that the world of Justice Society has way more compelling characters than a single book can handle. The writers mentioned their excitement to throw the spotlight on characters that haven't had much to do lately, such as Mr. America and Obsidian. As Willingham noted, there just has not been enough room to give these super-people the time they deserve, and the move to Justice Society and JSA All Stars will hopefully put that right.